My old kitchen, a small and decidedly non-ergonomic space, had a magnetic knife strip screwed to the wall: it was convenient, though it looked a bit menacing thanks to the giant Chinese cleaver stuck at one end. Fast forward a year: my new kitchen’s in-drawer slotted knife storage, a supposed improvement over the wall strip, hasn’t worked out so well. I am forever opening the drawer with soiled hands (which means I have to constantly clean the drawer front & handle), or I reach for the wrong knife, or I drag the blade across the slot’s edges just after sharpening. So I took a chance and bought a Knife Butler on Etsy (pictured). The Knife Butler is a big, fat rubber magnet strip, designed to stick to a refrigerator’s side. 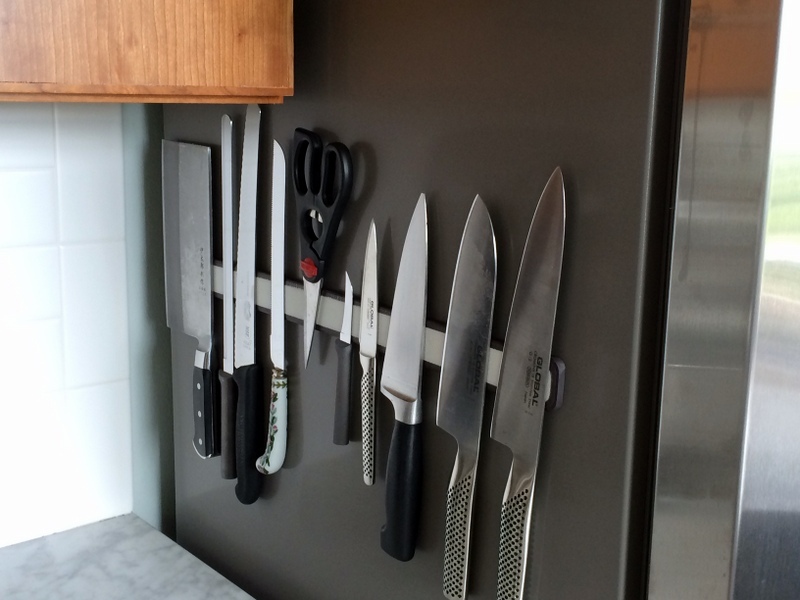 Unlike wall-mounted magnetic knife strips, the Knife Butler requires no searching for a stud, no screwing through a ceramic backsplash, and no effort to install. I simply opened the box, unwrapped it, and stuck it to the fridge. At 20″ long, it holds ALL of my kitchen knives (including that monster cleaver) and some shears. The rubber surfaces won’t dull or scratch my knives, and I can move/reposition it whenever necessary. Get your knives out of a block or drawer: go get a Knife Butler, made in the U.S.A and available in 10 different colors/finishes and two sizes. If your fridge sides aren’t accessible, KB sells a peel and stick version, suitable for mounting inside a cabinet door, beneath an overhead cabinet, or frankly, wherever you’d like to stick 20″ of knives. Coming soon: the Spice Drawer Solution…. We are sure we will need one. Our knife drawer didn’t work out all that well either, but we have a knife strip that is great. This one is even better because it’s versatile. My wife bought me a gorgeous striped, curved wood one custom made by a local artist for a ridiculous amount of $$ for Christmas two years ago. Because of our cabinets it fits absolutely NO WHERE in our kitchen that I can use it so it sits unused in a lower cabinet somewhere. Maybe I can hot glue it to the side of our fridge since it doesn’t work the way yours does, ha ha. Why not hot glue strong magnet strips to the back of it? Then it would work just like mine.